The Washington Redskins expected wide receiver Josh Doctson to fill a huge void when he was drafted two years ago with the 22nd pick in the first round out of TCU. [post_ads]Doctson does not have a 100-yard receiving game, nor has he caught more than four passes in a single game. But as he prepares for training camp and his third year, the former Horned Frog says he's ready to take a huge leap forward. "Every new year I'm looking to be better. I have been better," Doctson told the Fort Worth Star-Telegram on Saturday during a football camp he hosted at TCU. "Just off the field maturing, off the field understanding how to be a NFL player," he said. "There's just a lot that goes into this game that people overlook when they first get into the league. I lost my first year [to injury], last year I was able to play and then this year looking to do huge things." Last season, he compiled 35 receptions for 502 yards and six touchdowns, and with Terrelle Pryor leaving via free agency, the door is open for Doctson to be the No. 1 wide receiver. Having a new quarterback -- Alex Smith -- could make a huge difference for Doctson. 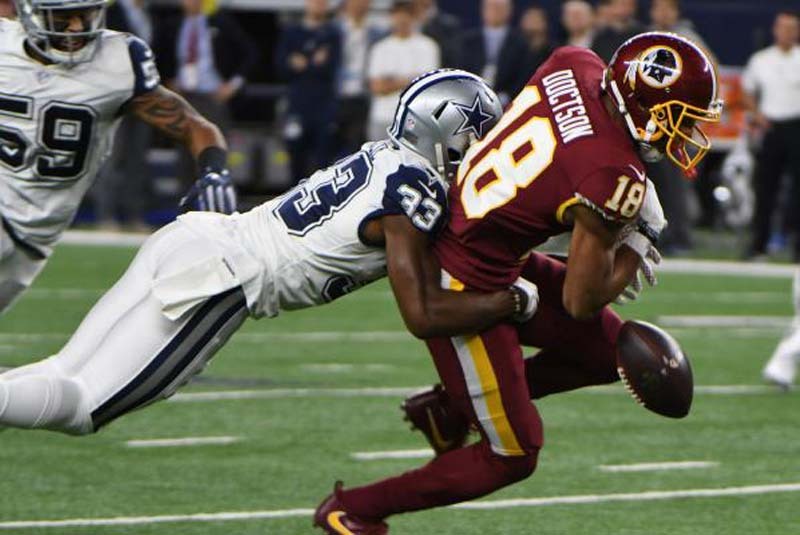 "It's been amazing [working with Smith]," Doctson said. "It's been fun. I've been there for two years, but this year stands out to me much more than the previous two just because I'm getting older and moving toward the veteran group. And just the guys, the chemistry with both offense and defense, we compete our butts off every day." He should have plenty of opportunity to show some growth, at least that's what Redskins head coach Jay Gruden believes. "I think Josh will get more opportunities to make plays on 50-50 type balls, which is Josh's strength," Gruden said in March. "Josh is not a guy, and we knew that coming in, that's going to get five or six yards of separation right away. He's a guy that builds up his speed; he can run, he can adjust to the ball like no other, 42-inch vertical was documented, 41, whatever it is. So that's where he gets the separation, by leaping and adjusting to the ball." Doctson believes the Redskins will be competitive despite what some prognosticators think. There's a good blend of rookies and hungry veterans. "I know we have the group of guys to do it. A lot of guys who care about the ballgame and care about each play, so I'm really looking forward to this year. "I think we're going to be all right."